Modena 1972. Italian championship 250cc. First lap : N.115 Isnardi Paolo, Motobi 6 tiranti; N.2 Renzo Pasolini, Aermacchi; N.74 Fosco Giansanti, Yamaha; N.14 Dave Simmonds, Kawasaki. Paolo Isnardi won the 175cc Junior Championship in 1970. These pictures is from "Motociclismo" Feb.1969. The article explained that in 1968 three Motobi's riders won the" Italian Juniores roadracing championship" in the 125,175,250 class and another one won the "Hill climb Italian championship" in the 175cc class. 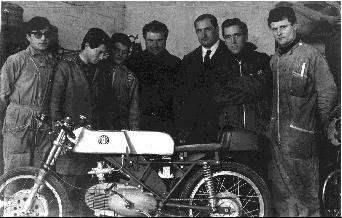 From left to right: Luciano Mele 125cc, Sergio Pannuzzi 175cc, Gian Franco Bianchi 250cc and Silvano Bertarelli 175cc. 1)Gianfranco Bianchi in 1967 as a privateer rider with a Motobi 250cc ; 2)Monza 1968 , the start of the 250cc class. 3)Bianchi and Battisti riders of the Motobi works machines . 4) Bianchi taking the checkered flag at Monza . 5) The podium . 6) Bianchi and Primo Zanzani smiling after the Monza race. 7) The Starting grid final race of the 1968 Junior Championship at Vallelunga 8) The celebration for the win of the 1968 Junior Championship.